Finding out how long it takes your grass seed / new lawn to grow in the United Kingdom has never been easier with our handy guide. For this guide we are looking generally at the grass varieties that are typically used in the UK. There are three important factors to consider when trying to work out how fast grass will grow. 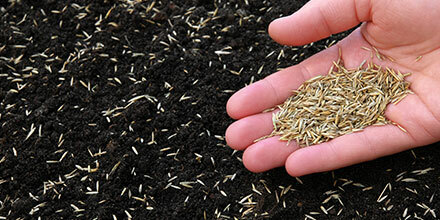 The mixture of grass seed varieties will have an impact on how quickly the grass will grow. There are 100s and 100s of grass seed types and while they grow at similar rates bear in mind the quality will not always be the same. Choosing the right quality of seed is really important, for example if your grass seed grows quickly but is patchy and poor quality it is a waste of time, effort and money so we always recommend using high quality grass seed. Generally speaking most household and landscaping seed mixtures will grow at similar rates, unless you have selected a special slow grow low maintenance mixture such as Low Upkeep or something a little faster. Typically germination takes 5-10 days depending on the species, the season will also have an impact on the germination time. In cold winter the seed shouldn’t be sown as it will not germinate or grow and it will remain dormant until the warmer weather arrives which leads to risk of damage to the seed, the seed being eaten or blown away etc. In colder weather or very dry conditions the seed can take many weeks to germinate, if your soil is esspecially dry we suggest you water it little and often every day until you see the grass come through the soil. In spring, autumn and summer (depending on how far south you are) your seed will typically establish quite well and quickly. Sunshine, air temperature and ground temperature are the primary ingredients that power the growth rate of your grass (not forgetting water of course). The further south you are in the UK the earlier your grass will grow and in some cases when we have a mild winter the grass will grow all year round (albeit slower in the winter). So how does all this add up? On average your grass seed will germinate and grow into grass in about 10 days. Once grown the grass will continue to grow at a rate of about 2/3cm per week. These will increase depending on your location and weather conditions.